If you work on a network operations team, you know how increasingly hard it is to understand and ensure application performance for your end users. You need visibility into areas where issues may occur – end-user devices, network and infrastructure – in order to identify and diagnose problems quickly and minimize downtime. But it hasn’t been easy to gain this level of visibility across the WAN or hybrid network without deploying additional probes, packet capture devices or remote site technicians. Blind spots are everywhere making it difficult to focus on managing and monitoring the applications that matter the most to your business. And when nearly 50% of a network’s traffic is web-based and it all looks the same to the network, identifying your important applications and staying ahead of their performance problem is more difficult than ever. That could mean inefficient troubleshooting, longer time to resolution, and an overall lack of application intelligence. Who wants that? No application is perfect, even with the most stringent instrumentation. 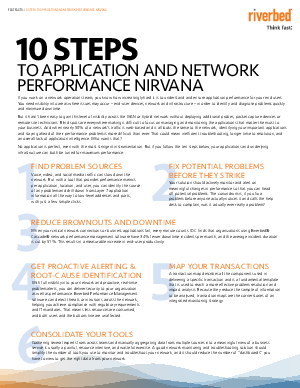 But if you follow the ten steps below, your applications and underlying infrastructure can both be tuned for maximum performance.